Located off of Route 4 in Fairfield, Ohio, Jungle Jim’s International Market can be described as a “food lovers paradise,” and is arguably the most unique supermarket in the world. This “megastore” offers food, beer, wine, seafood, cigars and so much more from all over the world. The store, started by CEO Jim Bonaminio in 1971, has now grown into a six-acre store offering food and other items from over 70 countries. Known for their many in store attractions such as their vast collection of animatronics, Jungle Jim’s is currently preparing to bring a piece of Kings Island history back to life. The Wild Animal Habitat and Lion Country Safari debuted at Kings Island in 1974 as a monorail attraction that took riders throughout various habitats of the world’s animals. For nearly 20 years the ride thrilled many park guests before giving its final rides at the end of the 1993 season. The trains sat idle until 1998 (the majority of track, exhibits, and structures of the attraction were removed earlier) when it was purchased and relocated to Jungle Jim’s International Market. 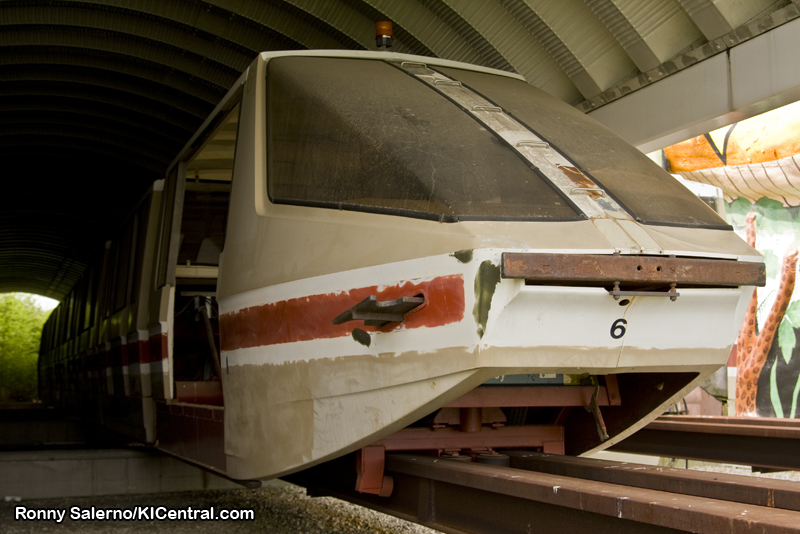 The monorail sat at its new home while the Jungle and its team developed plans for how they would use the monorail. 10 years and 3.4 million dollars later, the monorail is almost ready to once again carry riders. 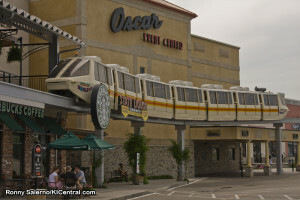 In June of 2008 I had the opportunity to tour the monorail set up at the store with Phil Adams of Jungle Jim’s and Keith Menter of Ethersville, IA, a former monorail operator who drove the monorail trains at Kings Island during the 1984 season. “One of our big problems at the store is parking.” Says Phil Adams, a representative of Jungle Jims. “People are coming for events at the event center and taking away parking from the shoppers.” Thus, the idea of using the monorail to alleviate parking congestion was born. The monorail at Jungle Jims features a station, transfer track, and maintenance shed on the back end of the stores property. The plan is to have guests attending a function at the Oscar Event Center park their vehicles by this station and ride the monorail to the terrace above the store where they can unload and enter the event center. “We’re tossing around ideas like having flat panel tv’s in the trains that can display wedding photos as you ride to the reception or a presentation pertaining to your event.” Noted Mr. Adams. The trains have been completely refurbished by Jungle Jims. They received all new electrical components, tires, and the rear car of each train will feature a clean-air diesel generator made by Kohler, as opposed to using electric bus pickups underneath the track as the monorail originally operated. The track is all new and specifically fabricated for Jungle Jim’s layout. Currently one train is on the main track and ready to go with plans for a second train to be completed and added soon. For the time being the monorail will operate on a single track with two trains while plans for a full circuit to be considered later. You may be wondering how two trains will operate on a single track. The answer is this; one train will load in the parking lot station while the second train waits behind it on the maintenance track. Train one will leave the station towards the event center while train two will pull off the maintenance track and into the parking lot station loading more guests. Train one will then unload its passengers at the Event Center terrace and proceed forward to an additional expanse of track while train two pulls up behind it and unloads. Finally, both trains proceed back to the parking lot station in reverse, train two going first. “We’ve got a lot of neat ideas we’re looking at like maybe having a haunted monorail in October that could take guests to a haunted house inside the event center.” Said Mr. Adams as we toured the monorail facility. Currently Jungle Jim’s is looking at possibly having the monorail open to the public by Fall 2008. Rides on the monorail will be free of charge, as for a name: “I say we just call it “the monorail,” since that’s what everyone knows it by.” says Phil. Keith Menter worked at Kings Island in 1984 as a monorail train driver after graduating high school. He made the trip from Ethersville, IA to Fairfield to tour the monorail at Jungle Jim’s and to see the trains that had not been touched since they left Kings Island in 1998. “I feel like Captain Kirk returning to the bridge of the Enterprise.” Remarked Keith as he sat in one of the dusty driver seats of a monorail train awaiting refurbishment. A lot of the cars have become parts donors for the trains being restored and may not be used once the monorail is finally completed. For Keith, that summer spent working at Kings Island was a fond memory for him. As we toured the trains that are still in their original condition we heard about what it was like to operate a monorail train at Kings Island’s Wild Animal Habitat. One of the challenges Jungle Jim’s will face with operating the monorail is how to properly defrost the windows and run the trains in cold temperatures. Throughout the tour Keith provided insight how Kings Island used to operate the monorail, in particular how to run the trains in the rain. Thanks to the efforts and creativity of folks like Phil Adams and Jim Bonaminio of Jungle Jim’s, we are seeing a piece of Kings Island history come back to life as a new attraction to an already unique shopping experience. Through the experiences of folks like Keith we remember the park of the past and are able to look to the future. Click here to see exclusive photographs of the Jungle Jim’s Monorail from June 2008 as well as s look into the trains waiting to be refurbished. Article by: Ronny Salerno on behalf of KICentral. For more information on Jungle Jim’s International Market click here. Special thanks to Keith Menter and Phil Adam’s of Jungle Jim’s!